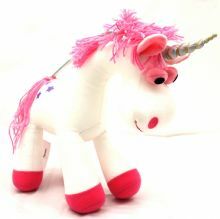 This white and fuchsia unicorn, moving up and down on a spring, will keep the toddler happy, make the baby smile. 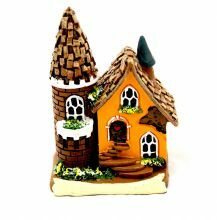 Made in soft fabric, lightweight, it is ideal to hang in any child's room. 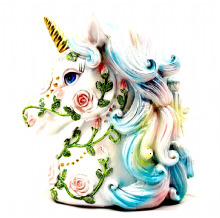 Unicorn head decorated with pink roses, intricately designed, a real stand out money box, Why settle for less when you can have something useful and beautiful? Unicorn key ring for hanging keys or simply used as bag accessory. For unicorn lovers who want to take their unicorns everywhere. 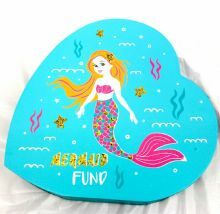 Dazzling in marine blue, this wooden mermaid money box has a heart shape design adding to its detail and uniqueness. Perfect gift for the mermaid collector.